If you are about to start the long hard journey back to fiscal well being or if you have been working on it for what seems like ages but just aren’t making headway, there is some good news. You don’t have to go it alone. There is a wealth of resources out there to get you going and keep you on track. From planning worksheets to money saving tips and ideas to make extra cash to ways to wrangle with lenders for the best breaks on rates and fees. This list of the 18 top blogs to help get you out of debt will give you all the best tools you need. Some of these blogs have been created by professional organizations using expert sources while some are real time reports from the trenches by people struggling with the same problems. Here are your goto sources for everything you need to make it. Read These Blogs Today & Become Debt Free! http://www.bloggingawaydebt.com/ Blogging away debt began in 2006 with original contributor Tricia. After 3 years she had paid off her and her husband’s $37,000 credit card debt and had also sold the blog to online financial entrepreneur, Jeffrey Strain. The torch was passed to a new blogger to share their journey out of debt. Since then there have been a string of contributors sharing the same journey. The current team of Ashley, Matt and Hope have a range of backgrounds and a mountain of debt. Posts are categorized to allow easy searching. Topics include home ownership, student loans, taxes and saving. Each week readers get a look at the successes and failures of real people trying to get out of debt. www.savingadvice.com/ This is the second finance and debt reduction site operated by Jeffrey Strain. As well as dozens of articles with sound money saving and money making tips, many written by Strain himself, the site also has an active forum for those with specific questions and a blog section. The blog section invites those struggling with debt to create a free blog on the site and share their tips, success and challenges with a supportive community of like-minded bloggers trying to get out of debt. Some are pretty standard budgeting and saving techniques but there are also a number of money saving and money making challenges that readers can participate in that help add a little motivation for those trying to get out of debt. http://www.moneyunder30.com/ Aimed at millennials, money under 30 tackles both getting out of debt and many other personal finance topics. Student loans and easy to qualify for credit cards have made it commonplace for young people to have a mountain of debt before they even enter the workforce. Since 2006, David Weliver has been blogging about and creating an online toolkit to help those in their 20s get out of debt and get ahead. The site includes rankings of the best low rate credit cards, guides to consolidating student loans and offers free courses on saving, debt reduction and making more money. http://manvsdebt.com/ Since Adam and Courtney Baker started the man vs debt blog in 2006, they have followed their own mission statement of “Sell your crap. Get out of debt. Do what you love.” Along the way Adam has appeared on TedX and his message has been talked about by dozens of major media outlets. 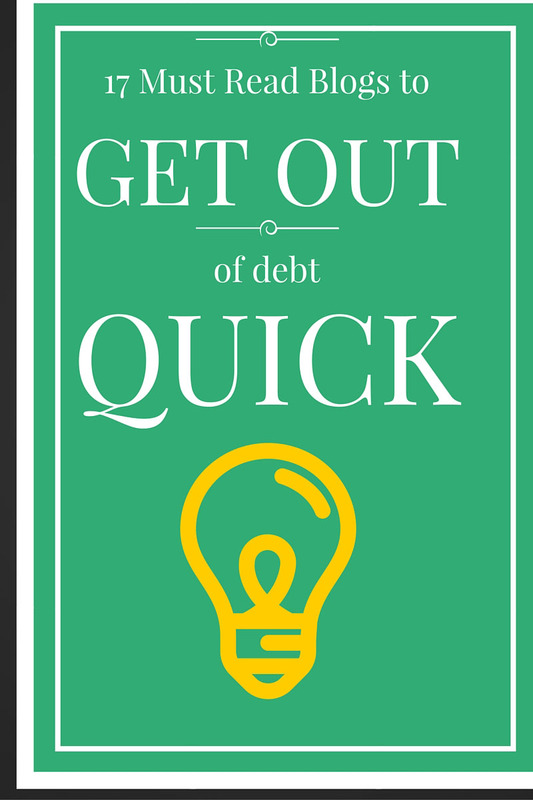 The site covers many of the standard debt reduction techniques but goes a step further by challenging the beliefs that drag many people into debt in the first place. It also challenges readers to not only pursue financial freedom but also to discover what makes them truly happy and living life in pursuit of their bigger goals. http://www.punchdebtintheface.com/ Blogging under an alias due to his day job as a special agent, Ninja and his wife Girl Ninja take on debt and a few other challenges with a little humor and a nice dose of common sense advice. If all the usual getting out of debt blogs have your spirits down check out Ninja’s 4th grade stick figure cartoons and finance raps along with his investment advice and cool furniture flipping side gig. http://deardebt.com/ Dear debt is the personal online debt reduction domain of Melanie from Portland. Having a familiar story, Melanie is a freelance writer and self described “all around hustler” from Portland, Oregon who graduated with a master’s degree in theater from prestigious NYU and $81,000 in student loans. Funny and quirky, dear debt is great debt fighting advice written as a series of breakup letters to end her relationship with debt. http://www.youneedabudget.com/blog/ Great budgeting info on the blog supports the sales of the downloadable budgeting software. You can also try a 30-day free trial and take free online classes in how to budget your way out of debt. http://www.debtroundup.com/ Easy to navigate blog covering all the debt reduction basics in an easy-to-read style plus a guide to setting up your own profitable blog business if you’re into that. http://gazelleintense.blogspot.com/ Bringing a new spin to sibling rivalry these two sisters and their respective families have made getting out of debt a competitive spectator sport. http://gailvazoxlade.com/blog/ Gail Vaz-Oxlade is a Canadian writer and television host. Mother of two, twice divorced and legally separated but not divorced (for financial reasons) from her third husband, Gail is widely regarded for her expert advice in the area of debt reduction and money management for single and divorced women. http://www.wisebread.com/ While not strictly aimed at debt reduction, wisebread has a wealth of frugal living tips and breaking news on where to get amazing deals. http://blondeonabudget.ca/ Another Canadian makes our list at Blonde on a Budget. Since beating down her $33,000 credit card debt, Cait, founder of BOAB, has gone on to embrace the minimalist lifestyle movement. You can follow her journey and see how her current 1-year shopping ban is going. http://www.mrmoneymustache.com/ Mister Money Mustache is like military boot camp for the fiscally challenged. MMM dishes out the hard facts of budgeting, saving and creating a lifestyle that is as badass as it is frugal. Along the way the money mustache man busts a few myths about money, how to make it and how to have more than you need. http://www.carefulcents.com/ Carrie Smith is like a Suze Orman for Pinterest. Her blog, careful cents, is targeted at helping freelance artists and other independent creative types manage their businesses and finances so they can have the life they dream of. After digging out from under her own $14,000 in consumer debt in 2012 she has gone on to quit her accounting job and create a community of 7,000 creative and careful artistic entrepreneurs. https://www.nfcc.org/ The National Foundation for Credit Counseling is the source for all kinds of one on one credit help. Whether you are struggling with student loans, a mortgage or consumer debt this is a great place to start. http://www.empowereddollar.com/blog/ The empowered dollar is like the funny pages of a debt fighting newspaper. Through cartoons and poems the ED manages to instill the basics (and the most important stuff is all basic) of getting out of debt and smart money management. The site also shares some of its creators “you can do anything” philosophy of life. http://www.daveramsey.com/home/ No list of getting out of debt blogs would be complete without Dave Ramsey. While some people knock Dave Ramsey because he’s just so darn successful you just can’t ignore the reach of his blogs, books and syndicated radio show. You’ll find everything here you ever wanted or needed to know about personal finances but always with a strong emphasis on getting out of debt.